1.Slice bread crosswise so that each slice is about 1-inch thick. Cut larger slices into halves or thirds, if desired. Set aside. 2.In a shallow mixing bowl, whisk together the eggs, milk, vanilla and cinnamon. 3.Quickly dip slices (do not soak) in egg mixture and cook until golden brown on both sides. 4.Keep egg mixture stirred and spices well blended. 5.Sprinkle with powdered sugar and serve with warm maple syrup OR HONEY ! 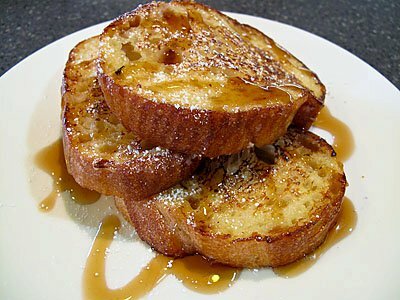 This entry was posted in Egg and tagged breakfast food, French Toast by Kamakshi. Bookmark the permalink.